The Egyptian Air Force has taken delivery of its first single-seat Rafale C fighter jets from Dassault, with two of an eventual eight arriving in Egypt on 26 July. The Egyptian Air Force now has 11 of its 24 Rafales on order. In February 2015 Dassault received a contract for 16 two seat Rafale Bs and eight single seat Rafale Cs. 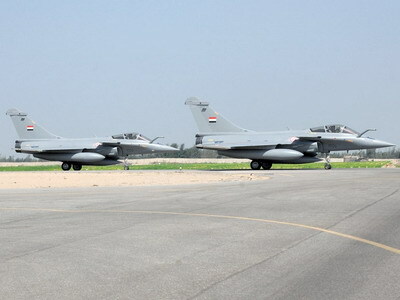 The first Egyptian Rafales were delivered on 20 July 2015, allowing them to take part in the opening of the expanded Suez Canal in August, and the next three on 28 January 2016. They were followed by another three on 4 April. They are in service with 34 Squadron of 203 Tactical Fighter Wing. “The new Rafale aircraft are a powerful addition to the capabilities of our air forces, as they possess high-level technical characteristics and combat systems, enabling them to perform long-range tasks,” army spokesman Tamer Mahmoud said in an online statement. The Egyptian Air Force is also getting MiG-29M fighter jets, with camouflage painted MiG-29s currently undergoing flight tests in Russia ahead of delivery. Deliveries are set to conclude by no later than 2020, according to Russian state-run news agency Sputnik. The 50 MiG-29M/M2 fighter jets being acquired by Egypt from Russia’s RAC MiG will be equipped with OLS-EU infrared search and track systems, PPK targeting pods and MSP electronic warfare systems, allowing them to carry precision guided munitions. Rosoboronexport signed the deal in April 2015.